OLDRIGHTIE: Is The Lid About To Blow? Is The Lid About To Blow? 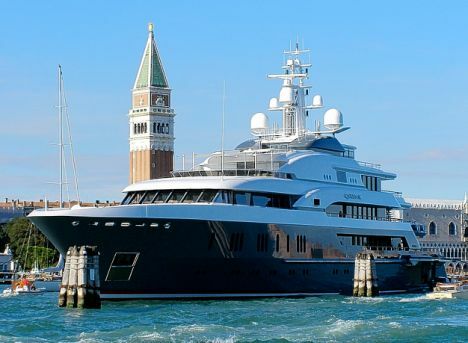 This is one of those luxury floating palaces beloved of the rich and powerful. Their massive billions belie any common sense. That private jet manufacture, the limousine motor vehicle industry and the kind of vessels above provide jobs and work for many thousands is all very well. Yet the global financial melting pot is overheated and about to explode. Is such a financial Armageddon likely to affect these people? Will the looming, self inflicted scalding, hurt the perpetrators of this mess? The Bliars, Kiddyfiddler Mandlesons, the Deripaskeys, Mittals, Camerons, Osbornes, Obamas, Merkels, Sarkozys? Of course not. What is happening, however will hurt many millions. People, regarded by those holding obscene wealth and or power, as expendable. These rich but ultimately sorry individuals crave a superiority they see only as available through the power they can create. Built through exploitation and ever larger counting houses. For these individuals, simple pleasures are unheard of. So a cruel streak is exploited along with sexual deviancies, inadequate relationship capabilities and total loss of genuine emotional existence. Thus their personalities can only thrive on excess. A celebrity culture has been created that nurtures and lauds this way of life, so our sheeples get ever deeper into a mindset of mimicry. Whole generations of less than adequate breeding stock is complimented with the globalised message of corporate propaganda called advertising. "You're worth it", "You can have it all" slogans have reverberated through the Western corridors of stupidity and debt. As this toxic message got ever more seductive our power brokers and sycophantic politicians flocked to the core of this flawed exploitation. For them huge political projects such as The European Union were created. An ever expanding bureaucratic and more importantly, unaffordable nightmare. So as this pathetic idol to Mammon and hubris starts to lose the ability to hide the flawed cracks in its edifice, panic is setting in. Yet behind the scenes the real power, the trillions controlled by the Rothschilds and their ilk is set to garner ever more wealth than ever before. Somehow their "maxim gun syndrome", (The selling of arms and trading with both sides in conflict and war) will be the victor. It was ever thus. Yet can it change? Can these oligarchs fail? Can the World find a global centre, a philosophical "Freedom Square" where this powerful dynasty can be challenged in the open? I just don't know. I am not against riches and wealth. I love the idea of success through hard work and decency. Morality doesn't need to be sacrificed to enterprise and earning power. What is lacking is a fairer spread and a more altruistic common purpose. I believe these potential solutions cannot be got through globalisation. The overreaching grasp of the Corporate fist has become uncontrollable.The vastness of inter-related webs of secrecy and obfuscation are vast weapons of mass destruction, where morality is concerned. We really do need a smaller world where governance and solutions are concerned. The EU debacle has done us something of a favour. If that was meant to be part of a New World Order construct and way to go, its "one size fits all "has been and is being seen as a massive mistake. It looks as if debt will need to be repaid and who has all the money and or power to do it? The very sources of the mess discussed. I doubt, of course, they will. So in that case it will have to be a nuclear option, I'm afraid. One developing rather rapidly, it seems.